01 Truck Mercedes Actros 6x6 15 t.
01 Truck Scania de 10 tonnes. 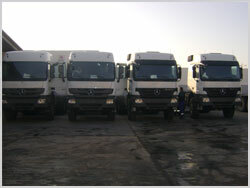 01 Truck Iveco de 10 tonnes. 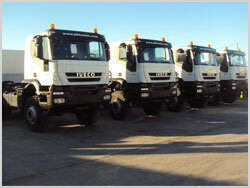 01 Truck Iveco de 02 tonnes. GTS provides you with 75 trays: They are in fact 12 open trailers of 12 meters in length and 2.5 to 3 meters wide. We offer the transport of your goods thanks to our trays. These latter are fitted with couplers, lashing cables, tarpaulins, and twist locks for transporting containers. We have also anti shock trays for transport in desert areas. The transportation company GTS features 8 Heavy Equipment Transporters of varied tonnage that ranges from 25 to 100 tons. 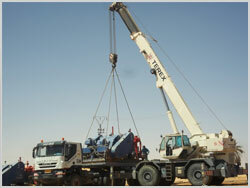 For Exceptional Transport covering all of Tunisia, the heavy equipment transporter can carry all types of business equipment. 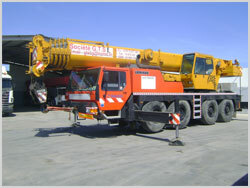 A crane 45 ton Fleche Telescope 38 Meters. A crane 80 ton Fleche Telescope 48 Meters. A crane 120 ton Fleche Telescope 42 Meters. 3 chariots telescopiques Fleche Telescope 17 Meters.